The promotions of Sajid Nadiadwala’s Dishoom are having its fans going gaga over the super awesome appearances John Abraham, Varun Dhawan and Jacqueline Fernandez have been making. And with their next promotional outing, the Dishoom team has taken the thrill a notch higher! Dishoom is touted to have Bollywood most expensive chase sequence and the Dishoom cast has recreated that scene live! 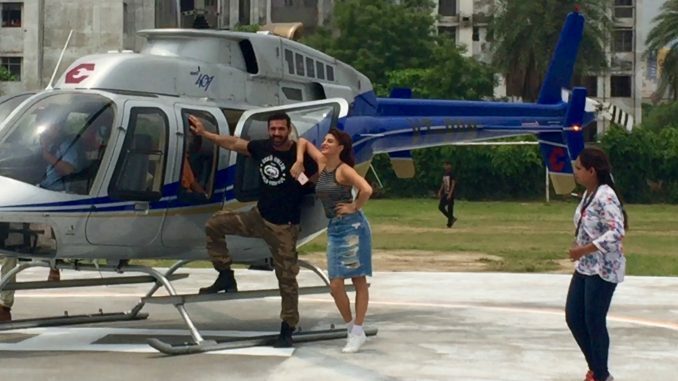 While in the capital for promotions, John, Varun and Jacqueline made a macho entry at Galgotia University in Greater Noida as they travelled from Delhi airport onto the campus in a helicopter! Yes a helicopter! What a grand entry! The actors were welcomed by thousands of thier fans, all in frenzy! Jacqueline got the temperature soaring as she danced on “Sau Tarah Ke”, while John and Varun rapped “Toh Dishoom”. With just 3 days away from release, the Dishoom trio is leaving no stone unturned. Directed by Rohit Dhawan, Dishoom hits the silver screen on 29th July. Madaari soaring at Box office! But How Did Zooey Deschanel Look At The End Of The Night?